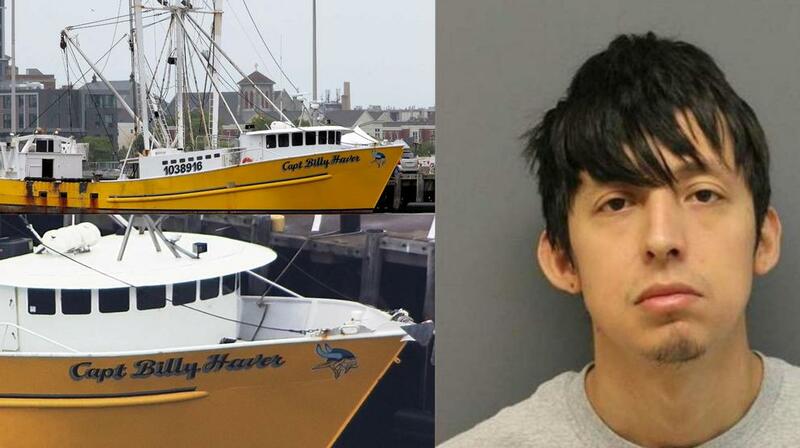 Just 55 miles off the coast of Nantucket, Massachusetts, authorities say they've apprehended an illegal alien from Mexico who was working aboard a fishing boat after he grabbed a knife and went on a slashing spree, leaving three injured and one dead. The slasher responsible is none other than 27-year-old Franklin Freddy Meave Vazquez, an illegal alien who police say is a Mexican national. Vazquez was working alongside a crew aboard a fishing vessel known as the “Captain Billy Haver,” which was sailing around 55 miles off the coast of Nantucket, in Massachusetts. With seven total crew members aboard the boat, including Vazquez, they were working into the mid-afternoon on September 23rd, of 2018, when “all hell broke loose,” one of the men claims. Vazquez and his victim began to engage in a fist fight when he grabbed a nearby hammer with one hand and picked up a knife with the other. At that time, another person tried to stop Vazquez, to which he responded by stabbing the man in the abdomen. Another crew member said he looked up and saw Vazquez gripping them a knife in one hand, and a hammer in another, the affidavit said. Vasquez told him, "Just stay there," according to the arrest affidavit. One of the surviving victims says he spoke to the FBI, where he prefers to go by initials “R.H.”, as he recounted he heard “yelling from the deck." When he turned the corner and with a hammer swung by Vazquez “received three strikes to the back of his head fell on the deck,” according to court documents. As the victim lay bleeding out on the floor, another crew member was struck by Vazquez with the hammer. That's when witnesses say Vazquez climbed up the mast of the ship, with the remaining crew members in hot pursuit trying to capture him. Some of the others he joined the Captain of the ship, as he placed a call on the distress channel for emergency services to arrive. The only vessel within the sight of the boat was a German cruise ship, the Mein Schiff 6, who quickly responded as it was the nearest vessel with "a medical supply option," said Nathalie Holst, spokeswoman for TUI Cruises. Two of the wounded were taken aboard the Mein Schiff, where another victim would be pronounced dead by the ship’s doctor. That victim had visible wounds to the head, and stab wounds to the torso, as confirmed by the ships doctor. "They bring back two persons. One was sitting and bleeding at the head. All around, everywhere was covered blood, all over the face. And one person was lying there, and I don't know what happened to him," Alex Goebbels, a witness aboard the German ship. According to court documents, Vazquez is a known illegal alien avoiding criminal justice in the United States of America. Franklin Freddy Meave Vazquez is facing charges of murder and attempted murder, and his family is not surprised. The mother of Vazquez's estranged wife said he has a severe drug problem, and had previously assaulted her daughter. Lindsay McDannold said that Vazquez is a heroin addict. She thinks "that's probably what precipitated this issue." The husband, a Mexican scalloper, allegedly was inside of his Newport News, Virginia home, and demanding his wife fork over her personal information so he could secure his citizenship. “He wanted her Social Security number and she wouldn’t give it to him,” Lindsay McDannold, the mother-in-law of Franklin Freddy Meave Vazquez. As recently as March 8th, of 2018, he was arrested in Newport News, Virginia where he attempted to kidnap a child victim. The newlyweds were purportedly having another fight that turned physical. “He choked her to get it out of her,” the mother, a Richmond, Virginia-based personal trainer, said. In that case, Vazquez is facing prosecution for abduction by force, intimidation, or deception, and had been released after paying a bond. “My daughter pushed back and Freddy dragged her up the stairs by her hair and choked her; she was basically tortured. She would go in and out of consciousness and he would choke her again,” the 19-year-old wife's father Shelby McDannold said. Marks on her neck, broken blood vessels on “her face from blacking out, bruises on her arms and on her side, discoloration on her chest for when he was beating and sitting on her,” Lindsay said of the injuries her daughter suffered at the hands of this dangerous illegal. Not only has he previously engaged law enforcement in situations where he was a criminal suspect, but he's fled from justice as well. ICE released a statement saying its agents "encountered" Meave Vazquez at the Norfolk City Jail in March 2018 and took him into custody upon his release. "Despite ICE's objections, an immigration judge granted Vazquez bond. ICE had to release him from back on custody April 27th after he posted bond," said the statement from ICE spokesman John Mohan. After local police released him at the time to the custody of Immigration and Customs Enforcement (ICE), an immigration judge granted Vazquez bond, despite the efforts of ICE to keep him in custody. Now, a man is dead as a result. The judge should be stripped of his robes and charged, but that's not the case in the ultra-liberal Sanctuary States. The charge of murder provides for a sentence of up to life in prison, five years of supervised release, and a fine of $250,000. The charge of attempted murder provides for a sentence of no greater than 20 years in prison, three years of supervised release, and a fine of $250,000. Vazquez will be subject to deportation proceedings upon completion of any sentence imposed. United States Attorney Andrew E. Lelling; Richard D. Cox, Special Agent in Charge of the U.S Coast Guard Investigative Services Northeast Region; Harold H. Shaw, Special Agent in Charge of the Federal Bureau of Investigation, Boston Field Division; and Peter C. Fitzhugh, Special Agent in Charge of Homeland Security Investigations in Boston made the announcement today. Assistant U.S. Attorney Christine Wichers of Lelling’s Major Crimes Unit is prosecuting the case. Once again, the President of the United States of America is confirmed to be accurate with his realization of the dangers imposed by illegal aliens. We need to build a border wall. It's time we demand one. Death penalty to never be able to return to America ever again.